With great power comes little excitement. The Galaxy Note 9 is Samsung’s passionate love letter to Note fans. It has insane specs, a gigantic, gorgeous screen, a Bluetooth-powered S Pen, and a headphone jack—all critical features for the kind of Android user that Samsung is targeting with a Note update. 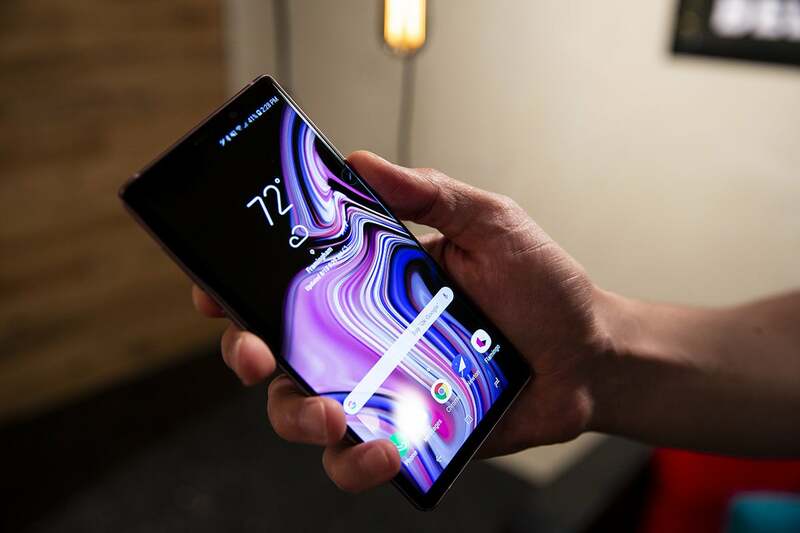 For devotees of the phablet, the Note 9 is a dream come true. The Air Command menu works just like before on the Galaxy Note 9. But once you get past the megahertz and gigabytes, the Galaxy Note 9 doesn’t bring much to the table beyond what’s in the Note 8. Granted, that phone was one of 2017’s best handsets, but a lot has changed in a year. In a post-iPhone X world, a recycled design, been-there camera, and gimmicky S Pen aren’t really enough to justify a price hike that pushes the phone firmly into four-figure territory. Even with upgraded specs across the board, the Note 9 feels very much like a phone we’ve seen before. Note fans may love it, but very few of them will be in love with it. The most interesting thing about the Note 9’s design is its color options. In the U.S., you can only buy it in blue or purple, choices that will more than likely split along gender lines. Otherwise, if you’ve held a Galaxy Note 8, you already know how the Note 9 feels. It’s taller and boxier than the Galaxy S9+ and a bit heavier as well. The Note 9 weighs 12 grams more than the S9+ (which in turn is heavier than the S8+), a noticeable increase, especially when trying to use it with one hand. The screen on the Galaxy Note 9 is simply stunning—but we already knew it would be. But with a 6.4-inch, 1440 x 2960 AMOLED screen, it’s unlikely most people will use their Note 9 without gripping it tightly with two hands. That’s a tenth of an inch bigger than last year’s phone, and it’s butting against the maximum this form factor can handle without being uncomfortably large. 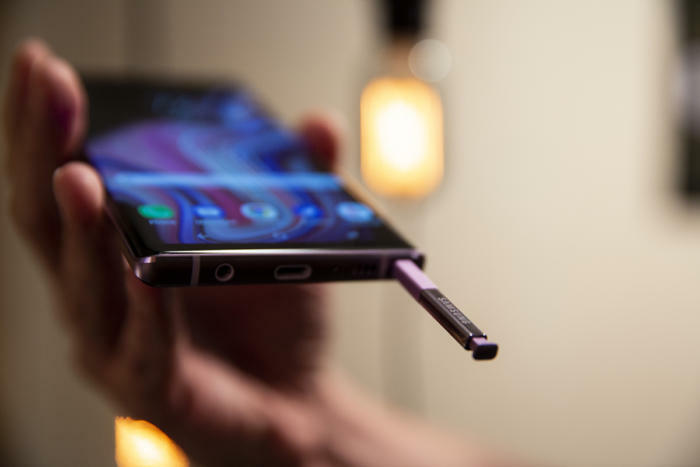 At about 6.4 inches (161.9mm) tall, the Note 9 is actually a touch shorter than last year’s phone, and it’s only a skosh wider at 3 inches (76.4mm, 2mm more than last year). Still, the whole package feels significantly larger than a phone like the 6.25-inch OnePlus 6, which measures just 6.1 x 3 inches (155.7 x 75.4mm). So next year’s model will need to trim the forehead and chin if the Note plans to continue growing. The back of the phone is nearly the same as well, with one notable change (other than the color). The location of the fingerprint sensor has been moved again, and it’s now below the camera rather than next to it. That makes it more likely to reach without smudging the lens, but it’s still too high and too small for my fingers. It’s almost comical now how Samsung just can't get it right. The location of the fingerprint sensor on the Galaxy Note 9 is slightly improved, but it’s still not ideal. In the meantime, the Note 9 has a predictably excellent screen. Plenty of superlatives have been written about Samsung’s display technology, and if anything, it’s a victim of its own success. It’s hard to discern much of a difference between the Note 9 and the S9, and in some instances, I actually found the S9 had richer colors and smoother gradients upon up-close inspection. But really, there isn’t much to complain about here. Sure, it would have been nice to get a 120Hz option like the Razer phone, or a true edge-to-edge design, but there’s no denying the Note 9 has one of the best displays you can get at this or any size. Samsung has made a big deal about the specs inside the Note 9, but unless you spring for the $1,250 model (which bumps the storage to 512GB and the RAM to 8GB), you’re not going to see too much of a difference over its peers. The $1,000 Note 8 has 128GB of RAM and 6GB of storage, the same specs available for less in the OnePlus 6T and Galaxy S9+, and it performs as you’d expect, which is to say it can handle pretty much anything thrown at it. 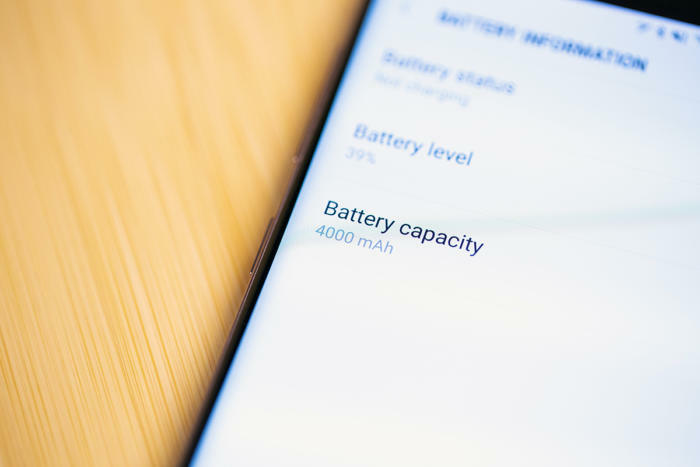 The Galaxy Note 9’s giant battery means it’ll last all day (most of the time). The Galaxy Note 9 also delivers a serious bump in battery capacity, from 3,300mAh to 4,000mAh, return the Note back to its pre-recall bragging rights as one of the longest-lasting phones around. Benchmarks put it right around 10 hours of regular use, on a par with the Huawei Mate 10 Pro, which also has a 4,000mAh battery. But while the Note 9’s battery life is significantly better than the Note 8's, it’s not a huge breakthrough over the S9+. It’s just bigger. There aren’t any neural-chip powered AI claims or new battery-saving techniques, and you’ll still need to charge it at the end of the day. And while I had a very hard time even getting it into the red on most days, heavy use still required a charge before bed. One particularly long day filled with hours of music streaming and on-screen navigation successfully drained the battery well before my day was over. That may be an extreme case, but Samsung’s target audience with the Note 9 is extreme users. The phone will still last longer than pretty much any other phone you can buy, and the multitasking Note crowd will certainly be able to do more for longer. Just maybe not quite all day. Battery life isn’t the only way the Note 9 will help users be more productive. There’s also an easier and cheaper way to connect to the DeX PC interface on an external monitor. Instead of a dock or a pad, all you need is a USB-C-to-HDMI cable. I tried it with a $15 cable from AmazonRemove non-product link and it worked as well as it did with last year’s $150 accessories. I don’t know how many regular DeX users there are, but I suspect a high percentage of them are Note users, so this move should encourage adoption. The Galaxy Note 9’s S Pen charges when it’s inserted into the phone. 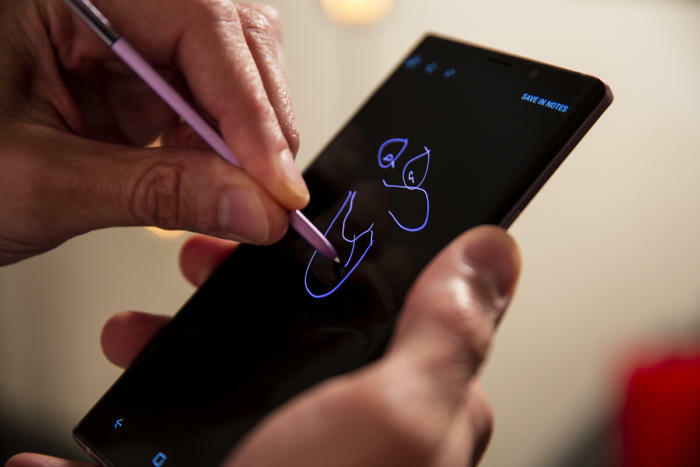 The phone has also gotten a significant upgrade to its signature feature: the S Pen. Like the Apple Pencil, the S Pen now has Bluetooth, but it’s not for drawing, it’s for distance. 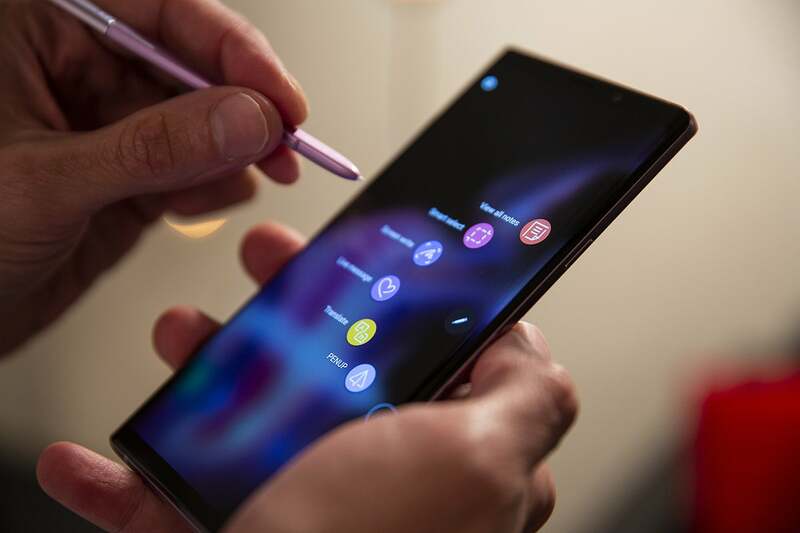 All of the traditional S Pen features are present on the Note 9—screen-off memos, translation, live message, etc.—and that’s still how you’ll be spending the majority of your time with it. Pop out the S Pen, however, and you will notice two things different about it: It has a button, and it doesn’t come in black or silver. 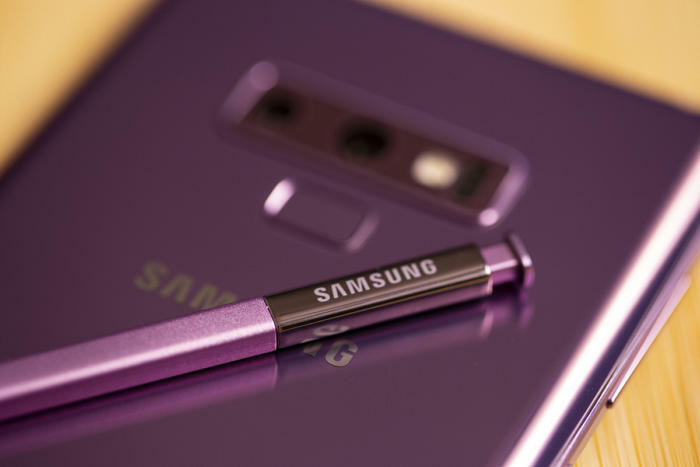 Samsung has crafted its new S Pen in purple and yellow to complement the two new colors of the phone. And as a neat touch, the pen writes in its body color on the screen by default. 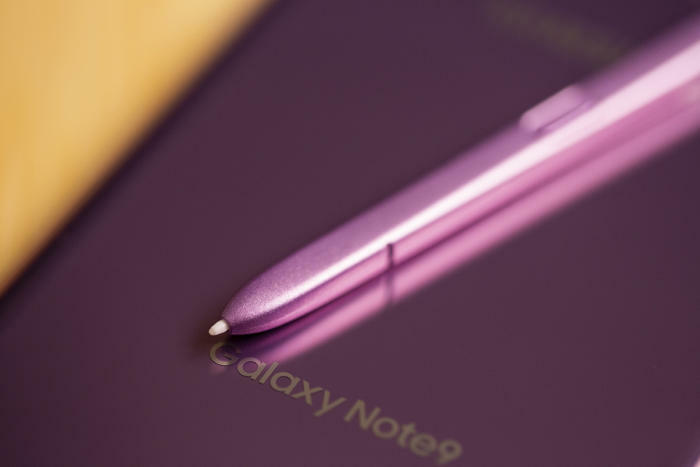 Doodling is the same with the Galaxy Note 9’s new S Pen—except now it’s in purple or yellow by default. The Bluetooth portion of the S Pen is decidedly less useful on a daily basis, but it still brings a few cool tricks—and loads of potential. Unlike other powered styluses, the S Pen charges whenevr it's inserted into its holster. It only takes about 40 seconds to go from zero to full, but it’ll also drain very fast. In my testing, I only got to about 420 clicks until the S Pen completely ran out of juice. On a few occasions I need to restart my phone after a random and unexpected disconnects. But mostly it works well. Clicking the S Pen’s button lets you launch and control apps, and Samsung has built in a handful of functions to get you started. The default action is the most logical—launching the camera and snapping a pic—but an SDK should lead to a flurry of third-party app integrations. Surprisingly, most Samsung apps don’t even work with it yet, but hopefully that will change soon. The Note 9 may be the first premium handset released in the age of Android 9 Pie, but you’ll likely be waiting a while to get it. The Note 9 is still running Oreo 8.1, so you’ll miss out on a few new features, most notably gesture navigation. The Galaxy Note 9 has new tricks but it’s running an old OS. That might not seem like a huge deal now, but once Google's Pixel 3 lands, gestures will officially be the hot new thing on Android, and Samsung hasn’t even offered a timeline for release yet. My guess is we won’t see Pie on the Note 9 until the Galaxy S10 makes its debut in 2019, so that means the best Android phone will be running an outdated OS for the first six months of its lifespan. One thing you will be getting with the Note 9 is a new version of Bixby. 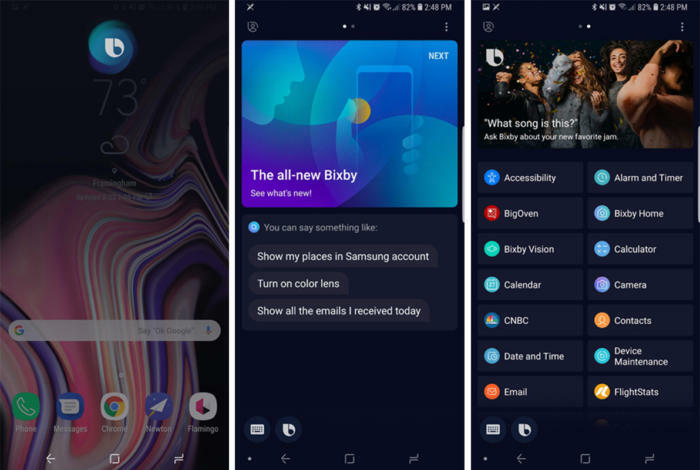 Samsung has enhanced Bixby’s abilities to tap into apps and naturally converse and contextualize, so it’s more like Google Assistant and Alexa. In my testing of an early version, Bixby’s greatest strength is still its ability to search through the Settings app, but it’s definitely improved since last year. One bummer, however: Samsung has taken away the ability to disable the Bixby key in the new version. Bixby has a brand new interface on the Galaxy Note 9. Which begs the question: Do we really need a third assistant on our phones? With Alexa and Google Assistant just a tap or voice command away on the Note 9, Bixby needs to be both perfect and pioneering to compete. Even if it were perfect and pioneering (which it isn’t), it’s an uphill battle. It’s a fight Samsung thinks it can win, what with the Galaxy Home speaker and all, but until that day arrives, Note 9 users will be happy to know Google Assistant still lives inside the home button. The camera on the Galaxy Note 9 is the exact same one you get with the Galaxy S9+. That’s a break from tradition and a huge step sideways from last year, which brought dual cameras with optical image stabilization and 2X optical zoom for the first time. 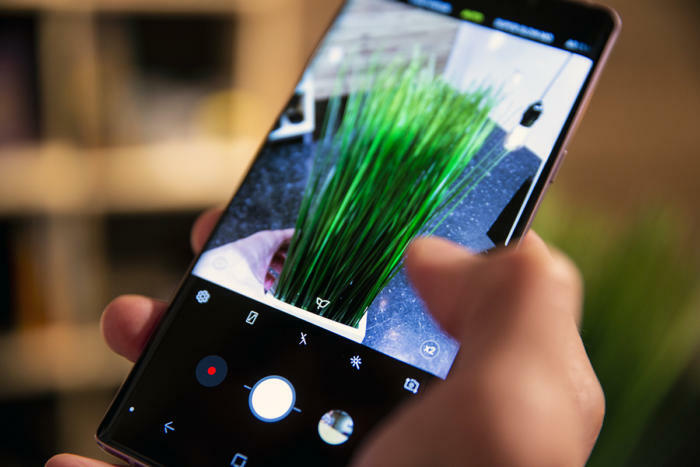 With scene optimizer on, the Galaxy Note 9’s camera will refine its auto settings based on what it sees. It’s not necessarily a bad thing. The Galaxy S9+ has one of the best cameras you can get in a smartphone, and it gives the Note 9 an improvement over the Note 8, with dual aperture and super-slow mo recording. But for Note fans who have come to expect a camera that pushes boundaries, there’s nothing here that’s particularly exciting. The only exclusive feature is an AI-powered scene optimizer that adjust the settings based on one of 20 preset scenes for things like food, nature, and sunsets. It works well, as I’ve documented in my AI camera shootout, but it’s hardly anything revolutionary. With scene optimizer on, the Galaxy Note 9 captured both the lighting and color of these flowers, while the Galaxy S9 (center) was slightly overexposures and the Pixel 2 XL (right) overcompensated for brightness. When I pitted the Galaxy Note 9 against the Galaxy S9 and Pixel 2, the Note consistently captured more detail, realistic colors, and sharper overall images, particularly in low light. But it’s not anything you’re going to notice unless you’re meticulously comparing pics side by side. Even in ultra harsh low light, the Galaxy Note 9 (left) took pictures with less noise and more accurate colors than the Galaxy S9 (center) and Pixel 2 XL (right). The Note 9 definitely has one of the best cameras you can get in a smartphone, but the differences between its camera and the cameras in phones that cost hundreds less is subtle. And with the new iPhone and Pixel right around the corner, Samsung might struggle to convince buyers that the Note 9 camera is worth the phone's price tag. Should I buy a Samsung Galaxy Note 9? 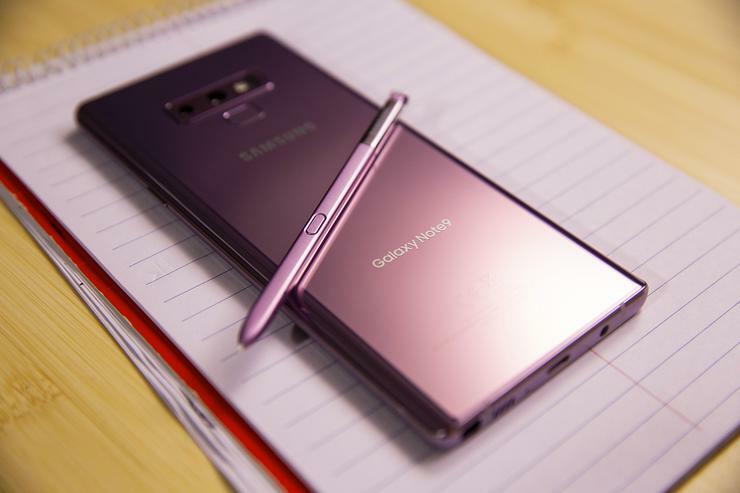 The Galaxy Note 9’s S Pen comes in new fashionable colors to match the phone. When Apple released the iPhone X with a four-figure price tag, a thousand-dollar Samsung phone was all but inevitable. 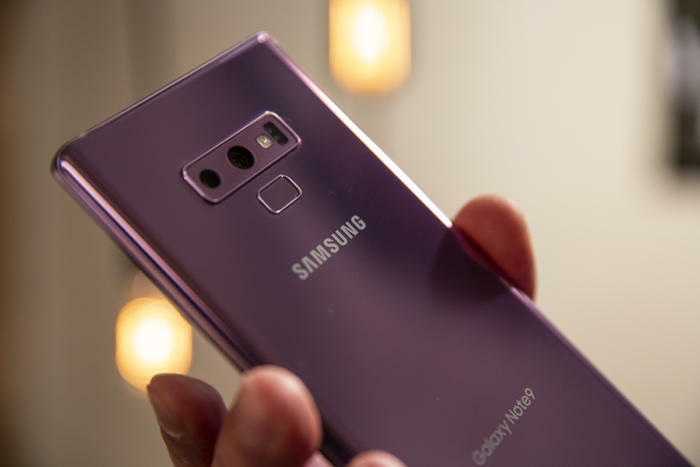 But the Note 9 seems like Samsung set out to make a thousand-dollar phone, rather than make a great phone that happens to cost a thousand bucks. The extra storage and RAM are nice, but Samsung is forcing people to pay for more, while not necessarily making the Note appreciatively better. The price may be moot for most people. Pretty much every outlet selling the Note 9 is offering bonuses, perks, and discounts, including generous trade-in offers for Galaxy phones going back to the Note 5. Most buyers won’t pay full price for the Note 9, many nowhere near it. Which is good, because otherwise they might feel cheated. Even if they did just buy the best Android phone.